The pace of business is accelerating, with internet and communications technologies allowing organizations to move with unprecedented speed. Executing new strategies, developing new products and services, or operating in new geographies are all business challenges that leaders now face with regularity. In light of these rapid business changes, organizations are acknowledging that they need to fundamentally change the way they manage people in order to ensure that they have the talent they need. According to the 15th Annual PricewaterhouseCoopers CEO Survey, 78 percent of CEOs expect to change their strategies for managing talent. 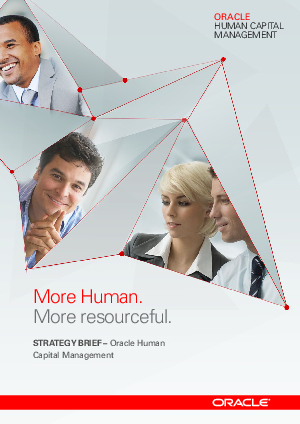 This strategy brief outlines how Oracle’s human capital management (HCM) solutions enable organizations to drive these urgently needed changes in two important ways. Oracle delivers the industry’s most complete, flexible and global technology foundation to help companies simplify how they manage people and empower organizations to build the best talent to drive existing and new business strategies.